Many of the markets in Chinatown in Toronto, Ontario sell a variety of vegetables, fish and fruit but the larger ones like this particular one also sells a vast amount of dried goods. A majority of the dried goods that are sold in Chinatown are not available at your local grocer, so a trip downtown is always worthwhile even if you are just browsing. Chinatown, Markets, Toronto, Ontario, Canada, North America. 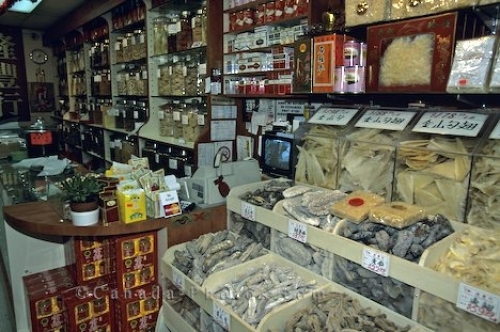 Picture of the bins and shelves of dried goods at a market in Chinatown in Toronto, Ontario.